Happy anniversary to WWE Hall of Famer, Bret “Hitman” Hart. On this day in 1992, Bret Hart won his very first WWE world championship beating “Nature Boy” Ric Flair in Saskatoon, Saskatchewan. Even more important, the title change began a changing of the guard from the Hulk Hogan era of muscle-bound monsters to a new younger, athletic era in the WWE. Bret Hart’s first title win over Flair is historic on so many levels. The obvious one being that this was the moment Bret Hart went from mid-level WWE star to main-event WWE superstar. Almost a decade after coming to the WWE as a part of the sale of Stampede Wrestling, Hart ascended to the top. This would be the last movement in Bret Hart’s career as he would remain a top-level professional wrestler for the rest of his years in the ring. Ric Flair was also significantly impacted from this match. This match signified that Vince McMahon had all but given up on Flair. The title change was random and came without any real buildup for a feud or even Bret Hart. The sudden title change was a reaction to Flair’s inability to draw as WWE champion. Flair would leave the company less than a year later and return to WCW. In all fairness to Flair, it may have been a case of bad timing. In a WWE world, Flair had the unfortunate timing of following Hulk Hogan, Randy Savage, and the Ultimate Warrior’s legendary runs as WWE champions. I don’t think anyone at that time could have come in and returned the WWE to the heights of the 80s. Flair also had the unfortunate timing of taking the crown in the midst of several WWE controversies and public scandals. Business would have probably been bad for anyone at that time. In the end, Bret had something on Flair that made the difference here in addition to youth. Bret was a WWE guy. Flair was still seen by Vince as a WCW/NWA guy. Flair was never given the patience that Bret was given to turn the company around. The match was also significant as it has been a source of controversy between Bret and Ric Flair to this day. Both guys have gone out of their way to criticize each other over the years. Flair called the match “awful” in his book, while Bret has called his series with Flair “disappointing,” and has labeled Flair as “overrated.” The match was aired in part on Prime Time Wrestling and has since been released on WWE Home Video. The irony between these two is that they settled their issues when Bret came to WCW years later. Flair seems to enjoy putting his tail between his legs when he has the chance to do business with his enemies. 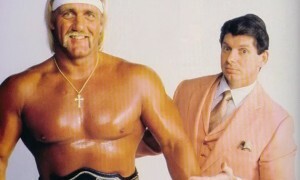 See Flair’s latest business relationship with Eric Bischoff and Hulk Hogan for proof on that. In WCW, the two had what many (including me) felt were a tremendous series of matches. Ironically, Flair has jumped back on the anti-Bret bandwagon since their WCW run. Whether they hated each other or are working all of us, the two tore it up in WCW. It is also likely that one of the most discussed moments in pro wrestling history never would have occurred if it was not for the events of October 12, 1992. Would there have been a Montreal Screw Job if Bret Hart didn’t get the nod in 1992? I highly doubt it as Bret has written about his many dalliances with WCW. Chances are that if Bret never got this run, he would have left for WCW at some point and may have never ascended to greatness. It is also likely that a small, younger, athletic, wrestler who didn’t fit the traditional mold for a WWE champion never would have gotten his opportunity as well. Shawn Michaels, you can thank Bret Hart for opening up those doors later. A side story to the title change is something that WWE Hall of Fame wrestler, Tito Santana revealed to me on my radio show and in his book. Tito told me in a 2007 interview that he was under consideration at this time to beat Flair for the title. According to Tito, it came down to Bret and Tito with Bret beating him out in the end. The story once again supports the theory that Vince had every intention of changing the direction of the company. Seventeen years later, as much as I like Tito I think it is safe to say that Vince made the right decision. Bret would wind up losing the WWE title on his first run to Yokozuna. Yoko subsequently lost the belt to Hulk Hogan. The brief Hogan run didn’t work and a lot of that has to do with Bret Hart. Hart set such an incredibly high standard for WWE main-events, that the Hogan-show wasn’t cutting it in 1993. Hart would later regain the title and truly cement the WWE’s new younger, and more exciting direction. Hogan saw the writing on the wall and would eventually leave for WCW. If not for the title change on this day in 1992, Hogan may have never left, and there may have never been an N.W.O. or Monday Night War. So happy anniversary Bret Hart and more importantly, the youth movement of the WWE. There aren’t many title changes that altered history like this one did. The change in the WWE was a much needed one for teenagers like me who grew tired of Hulkamania and was looking for something more. Other than a brief Hogan title run years later and the current run of the Undertaker, the WWE has pretty much stuck to its youth movement since then. The WWE we see today and many of the biggest events in wrestling history that we have experienced may have never happened if not for the little, unscheduled title change on October 12, 1992. Check out tons of exclusive wrestling interview videos at www.wrestlinginterviews.com. Read Bret Hart’s autobiography – Hitman: My Real Life in the Cartoon World of Wrestling by clicking here. Check out all of the latest DVDs and more at The Camel Clutch Blog’s official Amazon store by clicking here.